Not the best of pictures, but even from a distance the subject is still very recognisable! Natalie Threlfall, scoring a typical opportunist try for the University of Warwick, near the start of their game against Nottingham Trent University on Saturday, Warwick winning 35-0. Clearly Nat has lost none of her speed since leaving Letchworth! PS. We now learn that unfortunately 10 minutes after this Natalie was stretchered off with a broken leg. Get well soon, Nat! Percy Park, North Shields was the venue today for a big match in the career of one ex-Legend. A couple of years - after a legendary incident (involving, if I remember the story right, a tea-tray and a flight of stairs) - her playing career came to an abrupt stop, but after some impressive performances for Corps before Christmas, REME's Cfn Rosie "Randy" Randfield was finally selected for the British Army women's team. And today she played her first game - against Scotland A. No details are available yet about the result - however if she keeps her place in the squad, not only does she have games against Netherlands and Sweden to look forward to, but on 19th March the Army are due to play OA Saints - in St Albans. The frustrating pattern of rise and fall in the average girls club looks like it will be taking another victim with news from Wales that Colwyn Bay Mermaids look like folding at the end of the season. Who? Well, this was a pretty major side - well managed with a number of representative players - which has been North Wales' "Team of the Year" four years running, but even it has been unable to get past the six season barrier that very nearly saw the end of rugby at Letchworth, and seems to be the lifespan limit for most teams. It has been mentioned on here before, and it is a problem that many other coaches at other clubs are well aware of, but nothing ever seems to be done to try identify a solution to the problem. When you think about it, its a huge waste. Not only is setting up a new team an expensive business (though it attracts all sort of grants), but the collapse of a club will invariably mean that girls joining in years 3 or 4 will not be able to complete their junior careers and may be lost to the game, unless another club starts up nearby. It shouldn't happen. The same "mini rugby" programme that feeds boys into boys' junior rugby should also produce girls for girls' teams. With exceptional players it can work - almost all of the England team began their rugby in the minis - but rugby - and sport in general - is not just for exceptional girls. It is for everyone - super-talented, ordinary, or even the not-so-great-but-keen. Girls who are never going to play for England, and have no divisional and national ambitions, but just want to have fun. Mini rugby - the games' nursery - should not be driving them away. Even the best players need someone to play with, and who knows how many future stars of England (or Wales) have been lost because their club failed? Its not because girls of that age do not want to play - the early years of minis have plenty of girls playing, and the Hertfordshire U12 experiment showed that many want to play beyond that, but for some reason only the truly exceptional girls seem to survive mini rugby - too many seem to get the message that they are not wanted. Something needs to be done, and now we are one game, maybe now is the time to do it. Just imagine how big the game would be if every club that has taken the field since Letchworth started in 2004 still existed today? Up to the minute news -Sydney Gregson is in the London and South East Division U15 Squad! She now embarks a series of training sessions and warm-up matches leading up to the first ever Divisional Tournament on 1st May. "Just had the trials! They were really good - good competition! There were some really talented girls there! There were about 90 girls, and they are putting through about 30! First we had a warm up playing rugby netball and running, then played a 13 aside game full pitch, then some contact training, then decision making and passing then to finish it off we had 13 aside games on half pitch! There were loads of England people there and Maggie [Alphonsi] was there too! But yeah it was a good experience! We should find out within a couple of days who's in." Women's and girls' Rugby League gets an occasional mention on here, partly because it is assumed that readers will be interested, and partly because the problems and pressures faced by both games are rather similar - except that Women's Rugby League gets even less publicity, on a national level, than Union and, you would expect (given the stereotypical southern view of northern folk) face an even tougher problem with the attitudes of those in charge. Its therefore often a pleasant task to report how positive the RFL have been in their efforts to support their women's game - certainly the failure of last summer's abortive RL session which our ex-Legends tried to take part in was in no way the fault of the organisers, but rather a chronic lack of ambition and foresight from local women's teams. I mention this because an interesting article has appeared on the BARLA (British Amateur Rugby League Association) website, summarising the pressures, problems and ambitions of the women's game - interesting because anyone from women's union reading this will experience massive feelings of deja vu as they read it, from the dedicated few at the centre trying to expand the game - and the dominance of New Zealand at the international level - to the inability of clubs to send in match reports or give any importance to publicity generally (I just mention this because I suspect the non-appearance of all of the results from the last round of women's county games is certainly not the fault of the RFUW). I am also left wondering why the two sports - particularly at the youngest junior levels (where the rules are most similar and the skills all but identical) - fail to work together, or even acknowledge each other's existence. How many women play rugby? A common enough question, but remarkably difficult to answer (as this blog has highlighted now and again). All national unions issue statistics on such matters, but it has to be said that the basis of these figures are both inconsistent and of dubious accuracy. For example the RFUW's count - has been often said - seems to be a wild undercount when compared with the more statistically legitimate surveys that Sports England periodically produce. This is because Sport England actually ask a cross-section of the population what sports they have played within the last six months, whereas RFUW rely on data that is an off-shoot of the Rugby First database, the club player registration system. Trouble is there is no incentive for clubs to - for example - remove players from the system if they stop playing, add them if they start playing (unless they are actually playing in a tournament), or register at all if they are girls or women (because girls and and women are almost never asked for any registration cards for any tournaments at any level). In addition - as the register automatically defaults to "male" for every new entry - it is amazing how many male rugby players called "Sophie" and "Amanda" there are (or were when I last looked). The good news is that - at last! - RFUW are trying to do something about this, as they have circulated all clubs with an appeal to put their registrations in order. Its a tough ask - despite the fairly heavy tone of the missive sent out from Twickenham, while there remains no practical incentive to register players the RFUW totals will remain an undercount. Well, put it this way. Below are the Six Nations, the six totals given for their number of women players by each of the nations. But the totals and the teams have been mixed up. Which official total applies to which nation. Can you guess? Interesting this - three different and contrasting ways of promoting women's internationals, from Spain, France and England. They are fairly typical of the styles of poser each nation seems to use - England invariably going for something photo-realistic, France for something more... arty (though some have suggested that this particular example is being suggestive of... something or other), and Spain somewhere in between. What works best, do you think? Not a womens/girls' item this - but its possible that some readers will be interested. Sports management sims like Football Manager are pretty popular for a certain breed of games players, but while there are games for football, cricket, rugby league, and I dare say all kinds of American sports, there is no current game simulating rugby union. Well, not until today - because a sports enthusiast who has previous developed a rugby league game has now developed a rugby union sim. And what is more, its completely free. Rugby Union Manager allows you to "manage" and "coach" any major rugby club in the UK, Ireland, France, Australia, South Africa or New Zealand. You choose the teams, arrange training, buy and sell players and coaches, try to avoid bankruptcy, and also play in all the national tournaments. You also get to coach national teams and try to win the World Cup. The aim is to run your club for 15 seasons without getting sacked (normally for losing all your money, or not doing what your board expect you to do - ie. getting relegated!). There will be a few teething problems to begin with (one player in the Saracens squad is apparently 92 years old, for instance), and it can be very complex - also if you are expecting super graphics and such well... you're not going to get any (it is free remember). However, sports sims have always really been about statistics and tactics and coaching and team selections and so on, and if you are into that sort of thing then its really very good indeed. Sixth chapter of the summary of the history of women's rugby, translated from from the book "Rugger Girls," written by Jacques B. Corti and Yaneth Pinilla (foreword by Serge Betsen) published weekly on Des Filles en Ovalie. The Rhone-Alpes area of southern France was now alive with initiatives, the efforts of the leaders, and the best efforts of the AFRF - and now it was the Ile de France in the north to start to move. At that time the followers of Rugby Club Chilly-Mazarin included a couple who just moved into the city: the Noury family. In 1978, Wanda Noury becomes the chair of the club. Within a year she began to organize a women's match. "We looked for girls everywhere in Chilly. It a success and we played our first game as a curtain raiser to one of the boys's games. I was 36 years and was my first match. It was against girls in Gennevilliers, who were very sturdy, and dressed in black. We were impressed. But we managed to score a try, and were pleased with that. It was great fun! ". "It was Henry Fléchon at Bourg-en-Bresse. It was then that I discovered that there were many more teams. He asked me if I wanted to be part of the Association. " The idea was to use Wanda's enthusiasm. She made many contacts with Soisy and Gennevilliers - who were both teams trying to start teams. Wanda Noury became the AFRF's representative for Ile de France, while continuing to lead the Chilly women's team. Unfortunately there is now nothing other than memories and recollection of those early days. All of the documents relating to women's rugby from the period, including all details of coaching licenses, were lost when flooding of town of Auch destroyed the house of the then leader of AFRF, Maurice Maygmaut. Is this the first photo of a women's rugby team? Could this be the first ever photograph of a women's rugby team? It was sent to me back in October, having first appeared on a women's history website from South Wales called "Quiet Women's Row". Apparently the glass negatives turned up during some council redevelopment work in the 1970s, but with little information. All that is known is that the picture was probably taken in Newport. However, the date added to the picture is almost certainly wrong - the dress of spectators seems to indicate something from the mid 1910s, some time during the First World War maybe. And if that is so we may be able to have a good guess about what the game was, because in 1916 the earliest recorded women's rugby match in Britain took place, between teams of women from Newport and Cardiff, to raise money for the war - and fascinatingly reports from the game say that the women wore caps or head protection of some sort... which is what the women above seem to be wearing. Whether that picture was from that game, 95 years ago, we'll probably never know now - any more than we can know which team it is, or who the women were. But it is an important piece of women's rugby history, and women's sport history as well. News from Syd about Letchworth U15s winning their second game of the season. Well, not so much "win" - it seems - as an annihilation, a 52-0 win over Old Albanians. Syd ran in seven tries, apparently. So the "new" Letchworth Girls continue to go from strength to strength! Well done everyone. The most unexpected of honours? A remarkable - and to the more cynical of us - unexpected award was announced today. It was not that the recipient of the Rugby Personality Award was that unexpected - if anyone was likely to be the first woman to win the "Pat Marshall Memorial Award" then Maggie Alphonsi was always going to be a pretty safe bet! - it is more who makes the award that is a surprise. First the award itself. It is for the leading rugby "personality" (ie. player, coach, or administrator) of the year. Its an international award and covers the whole game. Previous winners in the 50 year history of the award have included al-time greats of the game including Gareth Edwards, JPR Williams, Jean-Pierre Rives, David Campese and Jonah Lomu and this year's shortlist included IRB Player of the Year Richie McCaw, RWC 2007 winner Victor Matfield, and Saracens' departing director of rugby Brendan Venter. In short it is one of the most prestigious awards that anyone in the game can possibly win. But it is the people that vote for the award that is amazing - the Rugby Union Writers Club. Yes - the group who have been accused by some (ahem...) of being blinkered out-of-touch sexist dinosaurs (or words to that effect, if I remember right) and it is recognition of the astonishing effect the last World Cup has had on the game. For a profession whose senior members have openly said in the (recent) past they they would not cross the road to watch a women's game, or - after attending their first women's test match - have produced the most patronising of copy about how amazed they were by it all (they run, they tackle, people come and watch!) this appears not so much change of heart as a complete Road to Damascus moment. Yeah, verilly, they have seen the light! Hallelujah! Well, we shall see. The Six Nations starts in a few weeks time - that will be the test to see whether or not the things really have changed. After all, last year the pretty much all newspapers failed to even list results never mind publish any match reports. Not by their words (or awards) but by their column inches shall we judge them. From the book "Rugger Girls" written by Jacques B. Corti and Yaneth Pinilla. Foreword by Serge Betsen. Translated from Des Filles en Ovalie. Of all the referees, one decided not to accept these ban impossed by the FFR. His name was Henry Fléchon. A former manager and coach of junior club USB (we are back again to Bourg-en-Bresse!). He decided to take the side of girls - "If sport can abolish social differences, I hope it can also abolish the differences between men and women who share the same sport" said he at the time. This is the beginning of a rich and active journey that Fléchon took during the eleven years of his involvement with women's rugby. He was one of the engines of its development and its acceptance until he died on November 13, 1986. For the 1974-1975 season, Henry Fléchon, became President of Violets Bressan, from Bourg-en-Bresse, and 20 June 1975 he was appointed President of the AFRF (French Women's Rugby Association). He began a personal campaign to win recognition for women's rugby, meeting Albert Ferrasse (President of the FFR) repeatedly, but initially without result. Obviously it goes without saying that in this little world a large-scale community life develops, and this becomes a characteristic of the early women's rugby. While volunteering has always been the driving aim of Act 1901 organisations (voluntary bodies created under French law), this is hardly a novel scenario: an animated and active national collection of local clubs had been created. Although the AFRF grew, the idea of integrating the FFR was not abandoned. At this time Celine-Marie Bernard obtained her diploma as a physical education teacher, and she also now took part in the meetings with Albert Ferrasse, President of the FFR. "Once, in 1977, we went to his home in Agen. Once again we explained the importance of girls playing rugby. I made my own case, saying that - as a PE teacher - I wanted to be trained to teach or promote rugby. He began to understand that the future of rugby could go through this kind of training ". However, one thing he said remains in her memory: "He flatly said, 'I accept that women want to play rugby, but I do not understand why'". Exchanges between the two then began to bear fruit. In 1978, Marie-Celine Bernard became the first woman to participate in training with FFR. She studied for the first level federal coaching certificate in Dijon and remembers: "It was interesting, although I was the only woman named on the course. They wondered really what I was doing there. Anyway, it is a never-ending debate: we had to prove our abilities again and again on the field." Celine-Marie Bernard pursued her training, passing her Level 2, and then - in 1985 - the Federal Level 3". Extract from the book "Rugger Girls", Editions Atlantica (2005), Written by Jacques Corte / Yaneth Pinilla B. Foreword by Serge Betsen. This is the latest chapter, published by DFO today. The website promises that future chapters will appear every week, and they will appear here as they are published. Fourth part of the summary of the history of women's rugby, from the book "Rugger Girls," written by Jacques B. Corti and Yaneth Pinilla Foreword by Serge Betsen, translated from the blog "Des Filles en Ovalie"
6 October 1972. A letter from the upper echelons of the state beat down the enthusiasm. Colonel Marceau Crespin, then National Director of Physical Education and Sports, sent a note service to all Departmental Directors of Youth and Sports, and all the prefects. "I think rugby - a contact sport requiring qualities of endurance, strength and virility - is unsuitable for girls and women for obvious physiological reasons. Furthermore, it seems the organizers of the rugby matches - which look like female wrestling - try to get as many as possible through the ticket office, by allowing betting in the stadium, and morbid curiosity. Moreover, the same organizers are systematically attempting to attract new players, including from women's athletics teams and basketball. And finally, they have no regard for the rules of sports medical supervision. It is obvious that this is a dangerous practice physically and morally, so I urge you not to help or sponsor, these women's rugby teams." Unquestionably, there was a real desire to ban the playing of women's rugby. The FFR was also not left out, for its part banning referees from officiating at women's matches. The instruction was not always followed to the letter and the second championship of France was organized despite this instruction. Auch won the title at the expense of Tarbes with the same scoreas the first final, 10-8. For girls the ministerial note only reinforced their beliefs. Bernard Marie-Celine, for example, remembers it like it was yesterday: "As players this was not our concern. Of course it shocked us, and we laughed at a time. But, if anything, the Crespin letter motivated us. " Extract from the book "The Girl in rugby" , Editions Atlantica (2005). Written by Jacques Corte / Yaneth Pinilla B. Foreword by Serge Betsen. Part Three of the summary of the history of women's rugby, from the book "The Girl in rugby," written by Jacques B. Corti and Yaneth Pinilla foreword by Serge Betsen, translated from the blog "Des Filles en Ovalie"
(...) "In the early years of the decade things stay as the are - technically and training days, hours, reliability in general, all become habits of this new practice of rugby." These steps forward, of course, attract numerous critics. Claude Izoard has not forgotten the atmosphere: "Often leaders told us we were crazy. Establish the Association and the championship was not easy. FFR did not want to hear about it. Nobody wanted girls. The desire to prevent all this was real " . "Very quickly the idea of holding a first national championship appeared. This became a reality in May 1972 and the first final to be held on July 2 of that year, between the Adour and ASVEL Villeurbanne. The girls of Villeurbanne won 10-8. Annie Ferréol, who played at that first final, remembers: 'We played on a rotten ground. The grass was high. There were no stands. The locker rooms were prefabs. In fact, I remember better games against the Violets of Bourg en Bresse. That was the derby! We could not contain ourselves! " "From there, everything started to move. The first Regional Committee was created covering Burgundy and Lyonnais. The Poppies graduated and formed an independent club, led by Marie-Céline Bernard (...) ". To be continued ... "INDICATED AGAINST AND DANGEROUS"
Our Sydney Gregson has been selected for the trials for the first ever girls divisional squad. After the county matches before Christmas, county coaches were asked to put forward the names of their best players for these trials. The Divisional Talent Development Officer for London and the South East then looked at all of these county reports, and then started writing some letters. These started arriving today - so if you have not heard anything it does not mean you are not in, you could still hear next week. No list of all selected players has been published - so we don't know (and chances are the county coaches will not know either - they never did in the regional days). Its is quite an achievement to get this far - remember there are only four divisions now instead of 11 regions, so its probably harder to get into the divisional trials than it was to get into the old regional squads! The trials are on 23rd January at Hampton School in Middlesex. Second chapter of the French history of women's rugby, from the book "Rugger Girls," written by Jacques B. Corti and Yaneth Pinilla, , translated from the blog "Des Filles en Ovalie". "By 1969, initial contacts are made to be part of the French Rugby Federation (FFR). The answer was no. The Violets then decided to become independent by creating their own club. They choose the path that soon other teams would follow. At the same time three women other decided to move forward. Annie Bannier (Pau), Isabel Navarro (Toulouse), and Odile Militon (Tarbes) agreed to found a women's rugby union. On 25th October 1969, a meeting was held in Portet sur Garonne. Sixteen people were present, representing 6 teams: Pau, Tarbes, Toulouse, Villemur Châteaurenard and Beziers. 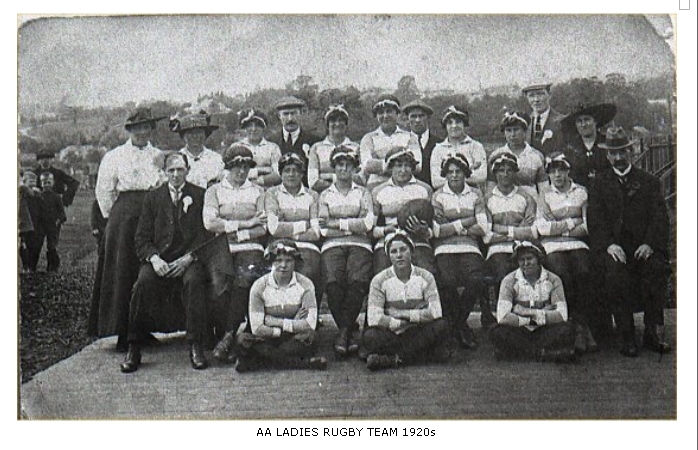 "On this day, we recognise that the ARF [Women's Rugby Association] was born" states the report. On March 4, 1970, the ARF is officially registered in the prefecture of Haute-Garonne. The headquarters was in Toulouse. The founding agreement of the new organisation was extremely thorough with more than 130 items. The articles were divided into three parts. The first related to corporate objectives. The second dealt with the sport's administration and finance. The third concerned the regulations for players, referees and officials. The annual fee for clubs was set at 50 francs. Officials and players had to pay a license costing 2 francs. If the license was not renewed before a match there was a penalty of 10 francs. And any kind of prize money was prohibited - only medals and artefacts were allowed. To be continued ... Part II "GROW anyway "
Rugger girls: A history of women's rugby (in France). Part 1. Books about the history of rugby are not exactly thin on the ground. A quick search on Amazon reveals dozens of titles, all of which have one thing in common. They are all about men's game - there has never been a book on the women's game. Well, not in English. There have been a couple in French, however - and one is currently being serialised on French women's rugby blog Des Filles en Ovalie (DFO). Also called "Des Filles en Ovalie" ("Rugger Girls" - 'Ovalie' being an affectionate slang term for the game) it was published in 2005 and looked back for 40 years of rugby in France. Although not about rugby in this country, it is interesting in that the pressures those wanting to play had to put up with mirror what happened here - indeed it was probably worse in England, bearing in mind that France started playing international rugby five years before any British team managed to get onto the field. So - with the help of Google Translate and a French:English dictionary - here is the first extract from the book. For anyone trying to follow the trail of women's rugby is not an easy task. We need to find witnesses. Unexpected journeys are needed. And we must, too, to investigate old photos. In short, they must take their pilgrim staff and pull together what is left from half-forgotten memories and documents. "What is important," said Claude Izoard, who saw the game begin, "is that girls and women today know what happened. " Our story goes back to 1965. Groups of students in Lyon and Toulouse decided to take part in the great charitable campaign against world hunger. Most of them had brothers and friends who played rugby, so they decide to organise a charity game at Bourg-en-Bresse. So, to begin with, there were about forty girls, who formed two teams. The Toulouse team wore the red and black, of Collège Stendhal, while Lyon - the "Violets" wore the purple jersey boys team from USB. Similar events happened elsewhere in France and, gradually, the clubs that are created, and became more organized. Women's rugby begin to structure itself. Lyon and Toulouse played several times. "We were invited for rugby get-togethers," recalls Frances Izoard. During the 1966-1967 season, led Andrée Forestier (a judo black belt), the teams played eight times, always charity games. Marie-Céline Bernard remembers her debut well: "I started in 1967. I was 22. I was doing athletics and the Toulouse men's team captain wanted to start a female team. The proximity of Bourg gave them the idea. It was a few games, in the spring, because temperatures were warmer." And so the "Poppies Tournaments" began. At Lyon there was a certain Claude Izoard, "Zozo" to her friends, an avid rugby fan. "In 1968, they asked me to be the captain. Two training sessions per week on Tuesdays and Fridays. The pitch was terrible. They showered in a sort of hut. It was that or nothing, and they knew it. " Games between the teams were organized - "competition" would be a big word for the first few matches. "There were always between 20 and 25 girls in training. They were between 17 and 25 years and were mainly school and college students, "recalls Claude Izoard. (...) "
TO BE CONTINUED ... Next Chapter "NO, AND NO"
Three more parts have already been published on DFO, which will appear on here over the weekend. After that future parts will appear as DFO publishes them, which will be weekly. Who'd be a Wasps fan? Again, slightly off topic but you are all rugby fans and it is surprising that more does not seem to have been made of this. Basically, Wasps have moved their next home game in the LV Cup from Wycombe to... Abu Dhabi. No, that's not some newly built stadium named after some Arabian sponsors but the real Abu Dhabi. Like in the Middle East. Near Saudi Arabia. Now, if I were a Wasps fan with maybe a season ticket, or someone who already had tickets for the game (a local "derby" against Quins) I'd be a shade peeved. I mean, Micky-Mouse competition as the LV Cup is, having your club move an attractive home game to another continent is a bit annoying - it is rather a long way to go for a Sunday afternoon's entertainment. "While we understand that many supporters will not be able to travel to the game, Wasps’ fans have always vocalised their desire for the club to grow and strengthen its brand and it is unique opportunities like this that can really propel Wasps into new realms." So - Wasps fans - this is all your fault because apparently you have said you want the club to grow. Admittedly you may not have realised that plans to "propel Wasps into new realms" meant completely new kingdoms, but its clearly always a good idea to read the small print. The Spanish RFU have produced a couple of good highlight videos of Sunday's game. Well worth a look - the Spanish forwards in particular seem particularly impressive, though in both teams speed of pass is a bit of an issue (as it was at the World Cup for Scotland). Apparently the game attracted around 500 paying spectators. When the girls section was formed in 2004 we thought about possible tours and - as there were plans for the boys to go to Ireland - we looked at whether the girls might join them. Nothing came of that for the simple reason that there was very little girls rugby in Ireland. The IRFU's website had no mention of it at all, and when we wrote to them the result was silence. Then in 2007 an English club did go on tour there. Worcester's tour made headlines on both the IRFU and RFU websites, as well as in the local press, as the took on (and beat) county and provincial select XVs. Since then the expansion of girls' rugby in the Emerald Isle has continued at a fantastic rate - its pretty unlikely that a single club could beat an Irish province today. The latest event was an U15 game played at the Aviva Stadium - the new Irish national stadium built to replace Lansdown Road, featuring girls from two local clubs (pictured above). Its another example of how junior rugby in the rest of the British Isles is starting to catch up with England. The reorganisation of junior rugby in Wales around four or five years ago has resulted in a noticeable improvement in their teams - an effect that had reached the U20 team last season, when they beat England. Scotland have also been working hard with their junior rugby as well, and will be fielding their first U20 side this year. Ireland can only be a couple of years away - which could potentially give us a junior "Five Nations" before the next World Cup comes round. The next step for England is the move to divisional rugby. This should produce a much tougher level of rugby for leading junior players than the old regional system (where the level of rugby in recent years had not been than much higher than county rugby). Trials for the first divisional squads will take place at the end of the month. It'll take a year or two before the results feed into the national squads, but there is a chance that some of the players selected this year could be playing for England at the next World Cup - or even for Great Britain at the 2016 Olympics! Spain's international "double" last season - European champions at both 7s and 15s - was largely overlooked by many people, mainly because it was perhaps so many leading players and teams were concentrating on the World Cup. Well, now everyone is back - and today Spain showed that 2010 was no flash in the pan, taking Scotland apart by five tries to one. The final score - 28-13 - was only as close as it was thanks to the kicking of Scotland's Caroline Collie (with two penalties and a conversion), while all but one of Spain's kicks were missed. Scotland - 8th in the World Cup, and 4th in the last Six Nations - fielded 10 players from the World Cup, so this is likely to be pretty much the team they will be fielding in this year's Six Nations. They will be kicking that tournament off one month tomorrow, against France. Its a tournament that will be even more unpredictable than ever, with all squads including a great many changes. International rugby - the second biggest women's team sport in the world? We are often told that women's and girls' rugby is a "minority sport", which is why it gets little publicity, funding, etc. etc. However, it turns out that, on a global scale, this may not be true. Its quite difficult to work out how "big" a sport is. The obvious thing to go by would be the number of players, but claims about player numbers by sports governing bodies are not always noted for their accuracy. Even the RFU's claims are - at best - dodgy, being dependent on a database that contains the names of many players who stopped playing years ago, while missing many who are currently playing (especially women and girls, if surveys by Sport England are anything to go by). When it comes to looking at player numbers internationally its pretty hopeless. However, another measure is to look at how active teams are - especially international teams - as reports on international games are normally kept fairly well by the various international governing bodies. And its when you look at the number of countries fielding women's rugby teams, and compare this with other sports, that you get a big surprise. Because an incredible 90 countries played over 300 women's internationals last year - either sevens or 15-a-side - to which another dozen or so can be added who did not play last year, but did in 2009 or 2008. This seems to be way more than the number of countries that played, for example, international women's hockey, or who have ever played - say - women's basketball or netball (in all cases around 60-70 countries). In fact only women's football has more active international teams - and not that many more (around 120, compared to rugby's 103). Some countries were amazingly busy in 2010, especially in Asia, and none more so than Singapore, who played an amazing 23 internationals in 2010 (plus a couple more against unofficial Australian and South African teams) - in comparison World Cup teams from Europe, like England, played 18 times at 7s and 15s. What is more, the number of countries playing in 2011 and beyond is likely to grow. Until last year several Middle Eastern nations played together as the "Arabian Gulf", but from this month each of these countries will be able to field their own teams. How many will remains to be seen, but if Iran can play women's rugby there seems to be no reason why countries like Kuwait will have any objections to the game.